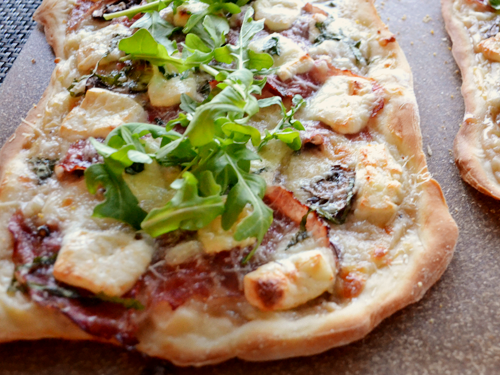 If you have a pizza stone, there are a lot of advantages to making pizza at home. You can make it as large or small as you'd like, you can pile on the toppings without having to pay the price of a tall latte for each one, and it is a great way to use up the random cheese and produce remnants lying around in your fridge. Assembling a topping buffet and throwing a make-you-own-pizza party is also an easy way to get food going for a group without having to spend all day in the kitchen. The other day I learned a neat trick that will get you a great fresh pizza dough in a snap. Here's how. Go to your local Whole Foods store. Go to the counter where they sell freshly baked pizzas by the slice. Smile at the staff members running the pizza counter. Ask them if they wouldn't mind bagging you a ball of dough. The way I learned this trick was a little different, however. I first checked in all the refrigerated pizza sections and then asked someone who was stocking the eggs for help, and he returned with a bag of dough which he said he got from the pizza people. The dough he handed me was soft and almost warm, as if it had just been removed from a warm spot after the yeast had risen. They even took care to throw a splash of olive oil in the bag before adding the dough so that the dough would not stick to the bag. Also, it was only $1.29 for 11 ounces, which to me felt like I was almost robbing the person who had put the labor into making such a beautiful dough and who had saved me at least two hours of my life. I took my bag of dough home and when I opened it, it still smelled of fresh yeast but even better, because it was yeast that I didn't have to wait on. As far as I am concerned, it still totally counts as homemade pizza if you get the fresh dough this way, stretch it out yourself, and top it and bake it in your own home. Unrelated: My paper ribbon flag tutorial was featured on 100 Layer Cake yesterday. A big thank you to the lovely ladies running that site! My local co-op has a similar set-up, they put out the left-over pizza dough daily in their deli section. I pick one up at least once a week. It's such a delicious and simple meal. The pizza at Whole Foods (and the rest of the food there for that matter) is amazing! Great post.